I learned a very important lesson in Punta Arenas — Chileans really crack down on parking scofflaws. As we walked around town, I noticed that there were parking enforcement officers stationed literally every two blocks. (They stand sentinel over their small slice of territory all day long.) It seemed that most parked cars had a ticket under their windshield wiper. I’m not sure what the rules are for parking since there were no meters, but these people meant business. Another fun fact about Punta Arenas is that instead of city buses, they have little cabs with big numbered signs on the top that act as public transportation. The little colectivos stop at scheduled locations and are generally packed, sometimes taking on the appearance of a clown car. 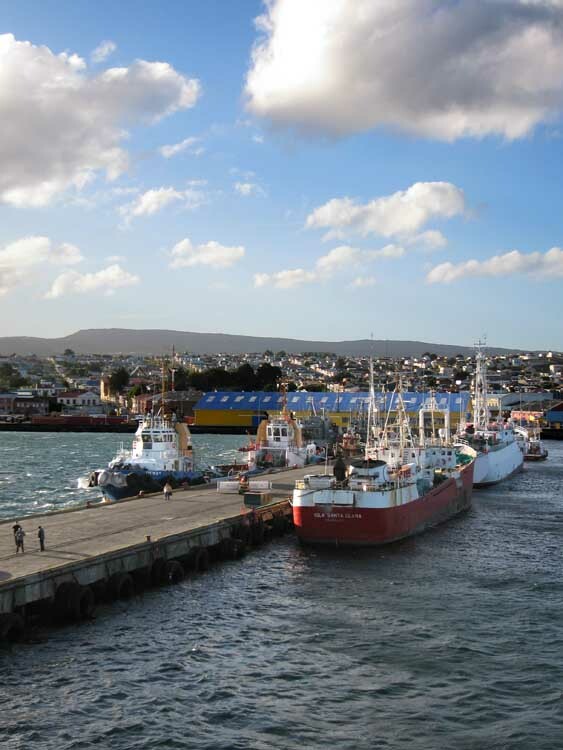 We also learned that Punta Arenas was once one of the most important cities in South America due it’s vital role as a stop for the world’s mariners on the trip around Cape Horn . The town is a quiet village now and is pictured here in the background. This entry was posted on Sunday, January 25th, 2009 at 7:52 am. You can follow any responses to this entry through the RSS 2.0 feed. You can leave a response, or trackback from your own site.